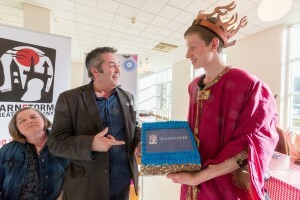 Youth Theatre cast member Brian O’ Reilly presents Philip with the cake! 25 years! A driving vision and a need founded Barnstorm Theatre Company in 1991. A vision that everyone has a right to a cultural identity, to a heritage borne from our past but one that moulds our future. A need to show that the arts, and in our case theatre, is not the preserve of the few – of those who can afford it or the traditional theatre-going audiences. In its 25 years of working from its Kilkenny base, Barnstorm has pioneered work for children and young people, for communities and for adults through its various strands of work. It has achieved this through dedication and the support of others; in collaborations and partnerships; in pushing boundaries, challenging the work and offering opportunities to others to develop their practice. 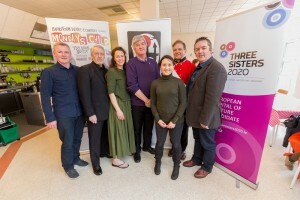 The Arts Council that has championed the development of our brand of theatre for young audiences. To mark Barnstorm25 we have developed some new partnerships to create an extended programme this year. We would particularly like to acknowledge Kilkenny County Council who have supported some of these partnerships through a number of funding streams, making Barnstorm25 possible. The staging of a play on the Leaving Certificate curriculum is a new venture and is a response to requests over the years from post-primary schools. Translations by Brian Friel is one of the greatest in the Irish canon and one that we are proud to introduce as the first in this new partnership. This partnership will see Barnstorm produce a Season of Family Theatre as part of Kilkenny Arts Festival. Barnstorm will host productions from three very different theatre companies, each committed to quality theatre for young audiences. World-premiere of a new play for children set during the 1916 Rising, and seen from the perspective of a young boy living in the Dublin of that time. Award-winning playwright Mike Kenny has worked with Barnstorm, with inputs from RTE Radio 1 presenter Joe Duffy, in creating The Messenger – a play for children aged 8 to 12 years – that will be presented in November in the Watergate Theatre. Barnstorm will offer a specially devised programme of engagement to Kilkenny schools. We hope that you enjoy and participate in Barnstom25 to join us in marking this special year.